The artist lived and worked in the Renaissance. His name was known throughout Florence (at that time this city was considered the center of art and painting). The fame of the brilliant artist was so great that he was assigned a special task – to paint the apartments of the Pope of Rome. 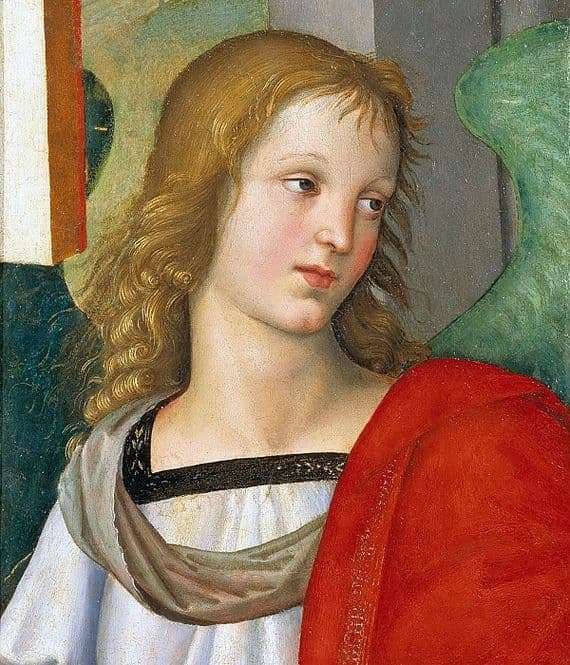 Rafael Santi painted the picture “Angel” at the beginning of the XVI century, at the age of 17 or 18 years. It should be noted that the canvas was written to order, and not by inspiration. On December 10, 1500, a local bishop approached a seventeen-year-old artist and offered a contract to perform an altar image in honor of the coronation of Nikolai Tolentinsky, who overthrew Satan. Upon successful completion of the order, Raphael was promised the title of “Master” and a good monetary reward. Only two fragments of this altar with a well-preserved picture “Angel” have reached our time. It is worth noting that already at a fairly young age (17-18 years old) Raphael skillfully conveyed the psychological state of a person on the canvas. If we compare two drawn angels on the altar, then the first one differs from the other angel in the softness of its features and the love in its eyes. The young artist skillfully conveyed the play of shadows and the contrast of lighting. Lighting, clothing and artificial sources of light, as if complementing all the softness of the character of the “Angel”, they harmoniously combine with the look and essence of the servant of the Lord. A single glance is enough for a picture to see the artist’s intentions to depict the contrast between two figures. Neither before Raphael, nor after him for a long time has anyone learned so subtly to convey the psychological characteristics of a person. In 1789, the altar was badly damaged by the earthquake, and only the picture “Angel” and “Virgin Mary” remained from it. At the moment, the picture is stored in the Louvre since 1981, when he bought it from the city taxi driver, who received the picture in inheritance.